Consistent file naming is an important part of organizing your files. 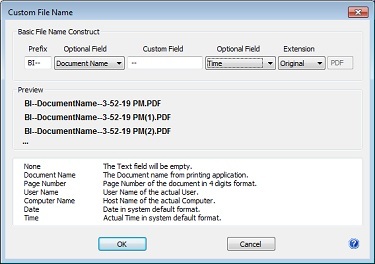 Black Ice Printer Driver’s new ‘Custom File Naming’ option provides an easy-to-use tool allowing consistent file naming when converting documents. Custom file naming is especially useful when the conversion results in multiple documents. The ‘Custom File Naming’ option is available in every Black Ice Printer Driver version 13.20 and above. The custom file name scheme is built through the Custom File Name dialog. To open the Custom File Name generation window, on the Filename Generation tab of the Printing preferences choose the ‘Custom file naming’ option in Filename Generation Method section. To use custom file naming scheme, please disable the ‘Enable Save As Option’. Press the ‘Configure’ button to start the Custom File Name generation window. A preview shows the selected custom file naming scheme if the output contains multiple files. If the result of the document conversion is a single output file, e.g. PDF file, the file name will follow the first line of the example. The Custom file naming option can be set programmatically through the BlackIceDEVMODE dll and ActiveX control and through the printer driver INI file. For more details please refer to the online documentation. Custom file naming added as an extra option and does not interfere with any existing file name generation method. Backward compatibility is preserved. Previous file name generation methods can be used programmatically with the latest 13.20 version also.